Following the army invasion of Nnamdi Kanu’s house, chairman of the South-East Governors’ forum has said Igbo leaders will not abandon the separatist. 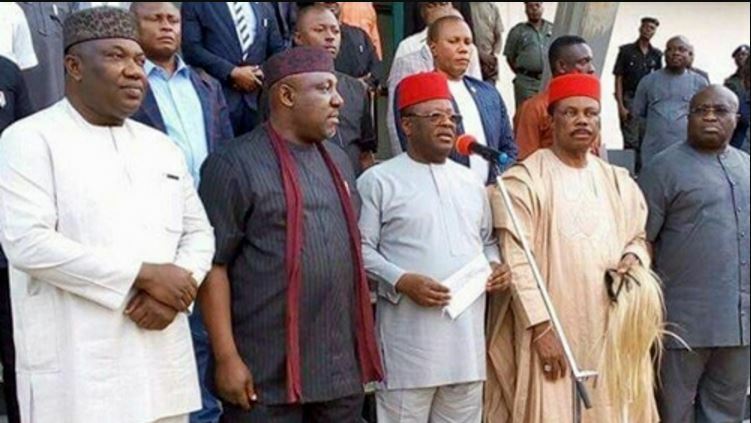 Chairman of the South East Governors’ Forum and governor of Ebonyi State, Mr. David Umahi, has said the the leaders of the South-East will not abandon the leader of the Indigenous People of Biafra, Nnamdi Kanu who has been missing since soldiers invaded his house.Umahi said Igbo leaders will find a way to reach out to him to avoid the group radicalizing like the dreaded Boko Haram terrorists. Asked about what will happen to anyone that will wear Biafra’s insignia or carry its flag, the Governor replied: “Well, there are two issues here. One is that we have appealed to Mr President to withdraw the soldiers in the South- East region at least for now for temper to cool. I am not the Commander-In-Chief of the Armed Forces; it’s Mr President who is. It is an appeal that we have made to him. It is his constitutional powers and rights. So, I cannot say for certain that Operation Python Dance will not commence in Ebonyi State. I don’t have such powers. But if Mr President views it that in his own opinion that he wants to heed to our appeal, that is good. But specifically in Ebonyi State, we are appealing that everybody should be law-abiding. There’s no nation inside a nation. Even if you want Biafra, you have to get it first; become a nation before you start putting up your flag, owning your own secret service and so on and so forth. “So far the members of Indigenous People of Biafra can still go to the Nigeria courts on their own, it means the sovereignty of Nigeria still stands and it’s binding on everybody; and as such everybody must submit to the law of that country, Nigeria. That’s what I want to say. My appeal is that our youths should not do anything that will be against the law. That is my appeal. When asked why Fulani herdsmen who have been causing havoc in the country walk about freely without being declared a terrorist group, the Governor responded: “We asked the General Officer Commanding [GOC] this question. I don’t have the details but the one I can remember is the Crocodile Smile in the Niger Delta. People were not killed. They gave me another kind of dance that was done in Ondo State. He mentioned not less than ten that had happened. They just call it anything. It’s a way of just having a name to go and do operation. If the herdsmen are targeting the South East, we wouldn’t have the problem in Zamfara, Benue and others. It is the way God wants it. When you find yourself in a certain position, you’ll have to find a way of solving the problem. “Is the agitation for Biafra because of the herdsmen? The answer is no. The question I will leave to our people is: what is it that we really want? We have to define means of knowing what we want. Our people should go back to hard work and determination which we are known for. It is God that blesses people. God can decide to deposit a lot of gold in the South East. So let’s go back to hard work.